Tue., Nov. 22, 2016, 2:13 p.m. If Rep. Cathy McMorris Rodgers were to be named to a cabinet post in the Trump administration, an election would need to be held to fill her seat. The U.S. Constitution requires a ballot, not an appointment, for a seat in Congress. The most recent example in Washington came in 2012, when then-Rep. Jay Inslee resigned from Congress to launch a successful campaign for governor. Inslee left office March 20, 2012, and the seat was vacant seven months before voters elected Rep. Suzan DelBene in November. Rep. Cathy McMorris Rodgers is remaining mum about her rumored job prospects in President-elect Donald Trump’s administration. The fourth-ranking House Republican from Spokane was captured on camera last weekend meeting with Trump at his golf club in New Jersey. Other visitors included former Republican presidential candidate Mitt Romney and Kris Kobach, Kansas’ secretary of state, who photographers captured with an apparent action plan for the Department of Homeland Security tucked under his arm. The speculation about Trump’s cabinet has run rampant in recent days, with the president-elect taking to Twitter and a self-published video to describe the transition process as smooth. McMorris Rodgers has been part of those conversations, to the point of prompting Spokane County Auditor Vicky Dalton to begin exploring a contingency plan if the congresswoman accepts a position in Trump’s White House. “We’ve been receiving calls,” Dalton said Monday. But the congresswoman has avoided all questions posed following Sunday’s meeting about whether Trump offered her a position in his cabinet. 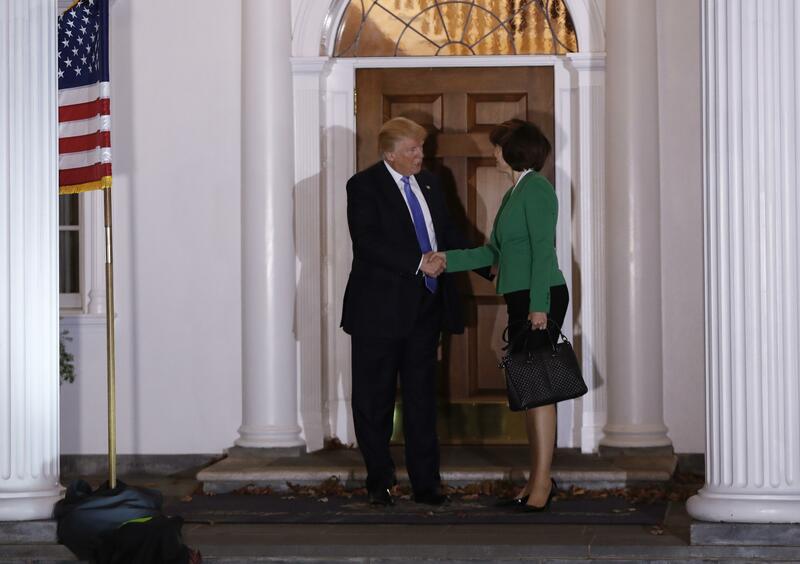 The meeting has drawn increased attention because McMorris Rodgers, who has criticized Trump for his public comments about women, was the president-elect’s only female visitor last weekend. Despite her tepid endorsement of Trump during the campaign, McMorris Rodgers also used her position as House Republican conference chair to arrange a meeting on Capitol Hill between the candidate and GOP lawmakers last summer after his path to the nomination became assured. The congresswoman appeared on two prescheduled radio interviews Monday, one with KXLY’s Kristi Gorenson and Bud Nameck, the other with Portland-based conservative talk show host Lars Larson. In both interviews, McMorris Rodgers refused to say if a potential cabinet position was discussed. “We had a great conversation about a whole host of topics,” McMorris Rodgers responded when Larson asked directly if she was being considered as part of Trump’s administration. Her response prompted some exasperation from Larson and a follow-up question that the congresswoman also refused to answer. In both interviews, McMorris Rodgers praised Trump’s meeting with Romney, another prominent Republican who criticized the New York real estate mogul on the campaign trail. Vice President-elect Mike Pence said Sunday that Romney is under “serious consideration” for secretary of state. Molly Drenkard, a spokeswoman for the congresswoman, said Tuesday that McMorris Rodgers’ focus remains on serving as House Republican conference chair, a post she was re-elected to last week. The congresswoman would not comment further on speculation about a cabinet position, Drenkard said. That hasn’t lessened speculation about where McMorris Rodgers might end up if she’s part of the new administration. Guesses by national pundits, including at the Washington Post, center on secretary of the interior, a post currently held by Seattle businesswoman Sally Jewell. The interior secretary is responsible for 247 million acres of public lands as well as grazing, mining and coal leases. McMorris Rodgers stressed her work on hydropower in her successful congressional campaign. She also touted work on national forest management legislation with Democratic Sen. Maria Cantwell, though the bill she helped work through the Republican-led House in 2015 was panned by critics for limiting public input in the rebuilding process. The U.S. Forest Service falls under the Department of Agriculture. If McMorris Rodgers were to be named to the cabinet, an election would need to be held to fill her seat. The Constitution requires a ballot, not an appointment, for a seat in Congress. The most recent example in Washington came in 2012, when then-Rep. Jay Inslee resigned from Congress to launch a successful campaign for governor. Inslee left office March 20, 2012, and the seat was vacant seven months before voters elected Rep. Suzan DelBene in November. Published: Nov. 22, 2016, 2:13 p.m.